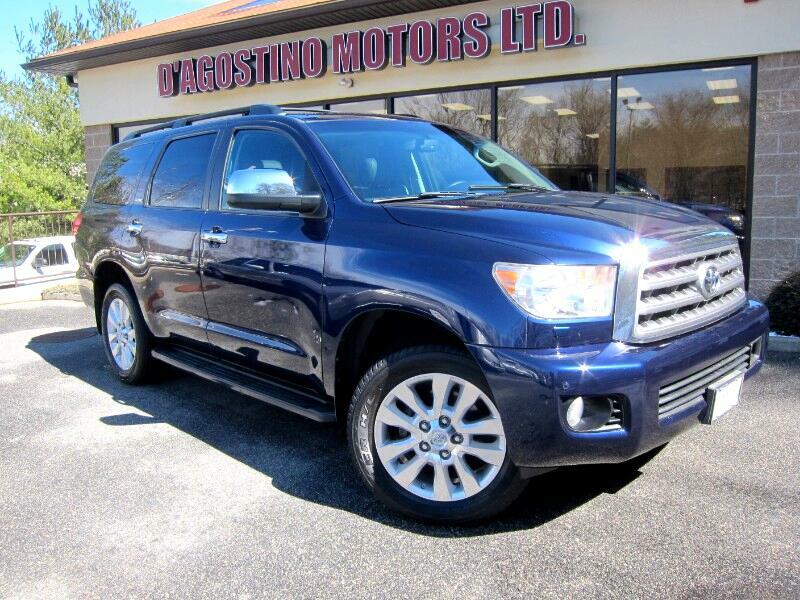 Used 2008 Toyota Sequoia Plantium 4WD for Sale in Smithfield RI 02917 D'Agostino Motors Ltd. RECENT TRADE !!! WHAT A GREAT SUV !!! IF YOU NEED SPACE THIS ONE HAS IT !!! IF YOU NEED COMFORT, THIS ONE HAS IT !!! IF YOU WANT EQUIPMENT THIS ONE HAS IT !!! PLEASE CALL FOR DETAILS !!! THIS ONE HAS NAVIGATION , BACK UP CAMERA , 3 RD ROW SEATING , POWER HEATED AND VENTILATED LEATHER SEATS , JBL SYNTHESIS PREMIUM AUDIO SYSTEM , POWER SUNROOF , DVD REAR ENTERTAINMENT , ACTIVE VARIABLE REAR AIR SUSPENSION , MIDDLE ROW CAPTIANS CHAIRS , REAR HEATED SEATS , TOW PACKAGE , MULTI FUNCTION STEERING WHEEL , 20 ALLOY WHEELS. Come Experience the D'Agostino Difference! We Go Through our Vehicles with a Fine Tooth Comb from All Mechanical Aspects to an Extensive Reconditioning and Detailing Process, Expect to View the Cleanest Vehicles in New England Guaranteed !! !